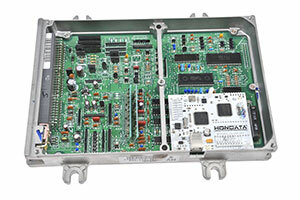 The Hondata Strain Guage is a gearshift mounted strain guage sensor and remote strain guage amplifier, which signals the ECU to cut the engine when the gear lever is moved. This enables very quick no lift shifts with dog engagement transmissions. The Strain Guage works by using a strain elements in the gear shift knob to measure the force on the knob, via accurately measuring the strain on an aluminium insert between the gear lever and gear knob. The aluminium insert has to bonded Omega strain gages which change electrical resistance very slightly when force is applied to the shift knob. Due to magic the very slight difference in resistence gets coverted by the Strain Amplifier to a voltage which can be used by the ECU to determine when you are applying force to the gear knob to start to shift the gears. 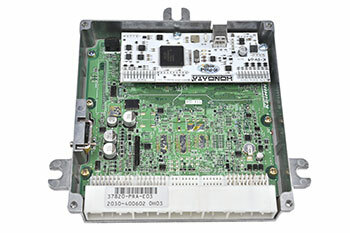 The Strain Amplifier also has a off/on output so that the ECU does not need to compare the voltage with pre-set parameters in order to determine if a gear shift is taking place. The Strain Amplifier has two adjustment screws, of for forward force and one for rearward force, so that the shift force can be adjusted quickly with reprogramming the ECU.